You are here: Home / Skincare / Skin Care Ingredient: Menthol – Do We Really Need That Icy Tingle? Skin Care Ingredient: Menthol – Do We Really Need That Icy Tingle? It is an organic compound made synthetically or obtained from corn mint, peppermint, other mints, eucalyptus and pennyroyal; it is a compound made from herbal volatile oils (technically an alcohol). 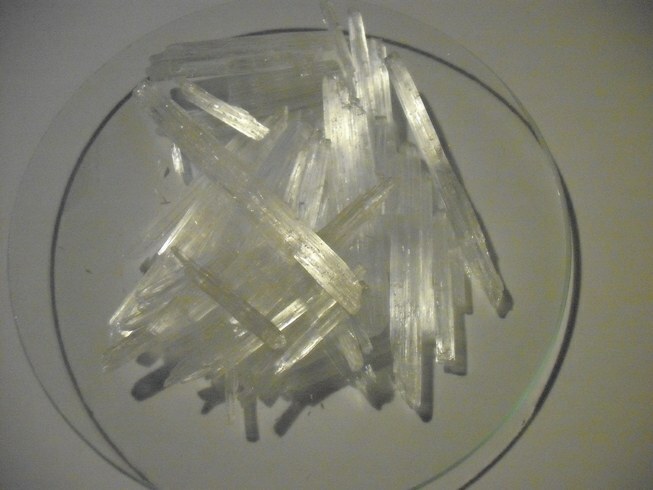 It is a waxy, crystalline substance, clear or white in color, which is solid at room temperature and melts slightly above. Menthol’s ability to chemically trigger the cold-sensitive TRPM8 receptors in the skin is responsible for the well-known cooling sensation it provokes when inhaled, eaten, or applied to the skin. In this sense, it is similar to capsaicin, the chemical responsible for the spiciness of hot chilis (which stimulates heat sensors, also without causing an actual change in temperature). Menthol’s analgesic properties are mediated through a selective activation of κ-opioid receptors. Menthol also blocks voltage-sensitive sodium channels, reducing neural activity that may stimulate muscles. A study showed that topical absorption of ibuprofen is not increased by menthol, but does note the complementary effect of the menthol as a pain reliever itself. As a smoking tobacco additive in some cigarette brands, for flavor, and to reduce throat and sinus irritation sometimes caused by smoking. Menthol also increases nicotine receptor density, increasing the addictive potential of tobacco products. Commonly used in oral hygiene products and bad-breath remedies, such as mouthwash, toothpaste, mouth and tongue-spray, and more generally as a food flavor agent; e.g., in chewing gum, candy. In a soda to be mixed with water it is used to obtain a very low alcohol drink or pure (brand Ricqlès which contains 80% alcohol in France); the alcohol is also used to alleviate nausea, in particular motion sickness, by pouring a few drops on a lump of sugar. In first aid products such as “mineral ice” to produce a cooling effect as a substitute for real ice in the absence of water or electricity (pouch, body patch/sleeve or cream). In various patches ranging from fever-reducing patches applied to children’s foreheads to “foot patches” to relieve numerous ailments (the latter being much more frequent and elaborate in Asia, especially Japan: some varieties use “functional protrusions”, or small bumps to massage ones feet as well as soothing them and cooling them down). When it comes to skincare, menthol can reduce redness and increase circulation to invigorate dull, tired complexions. Acts as an anti-irritant and leaves your skin feeling tingly and cool. Menthol can also be an analgesic (pain killer), local anesthetic, or decongestant. It can aid digestion, treat sunburn, and even fight bad breath. If you have sensitive skin, be careful not to overdo it on the menthol. It is an alcohol and can, in some cases, cause mild irritation or skin dehydration. It is an allergen to some as well. If your skin is really sensitive, look for L-Menthyl Lactate, a combination of menthol and lactic acid, which is less irritating but comes with the same cooling, calming effect.